SandboxEscaper is the same researcher who previously publicly dropped exploits for two Windows zero-day vulnerabilities, leaving all Windows users vulnerable to the hackers until Microsoft patched them. The newly disclosed unpatched Windows zero-day vulnerability is an arbitrary file read issue that could allow a low-privileged user or a malicious program to read the content of any file on a targeted Windows computer that otherwise would only be possible via administrator-level privileges. 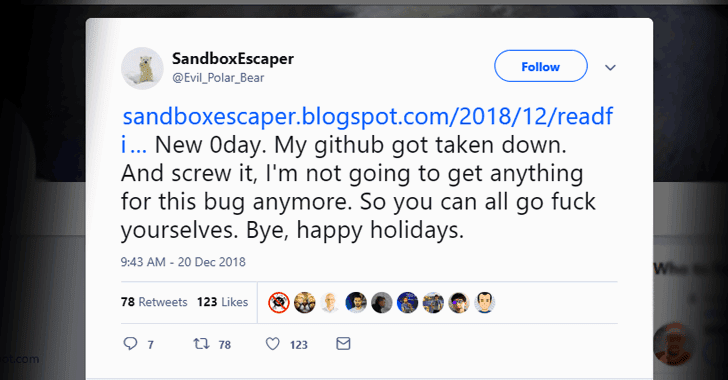 Besides sharing video demonstration of the vulnerability, SandboxEscaper also posted a link to a Github page hosting its proof-of-concept (PoC) exploit for the third Windows zero-day vulnerability, but the researcher's GitHub account has since been taken down. This is the third time in the past few months SandboxEscaper has leaked a Windows zero-day vulnerability.